M&A’s Scope: M&A delivered a perfect replica of the original entry doors and windows, including the ornate rope moldings over the doors, based on the building’s original architectural drawings. 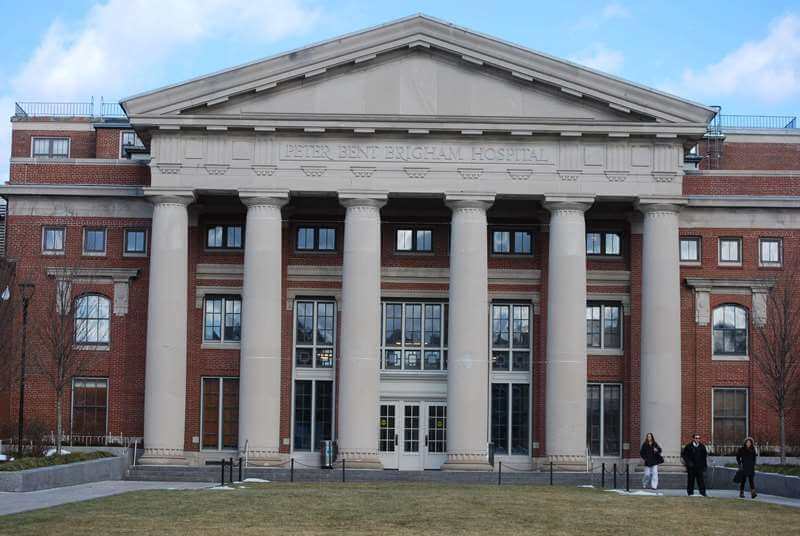 One of Boston’s most prestigious medical centers, Brigham and Women’s Hospital is the result of the merging of three Boston hospitals, the oldest of which is the Peter Bent Brigham Hospital, established in 1913. 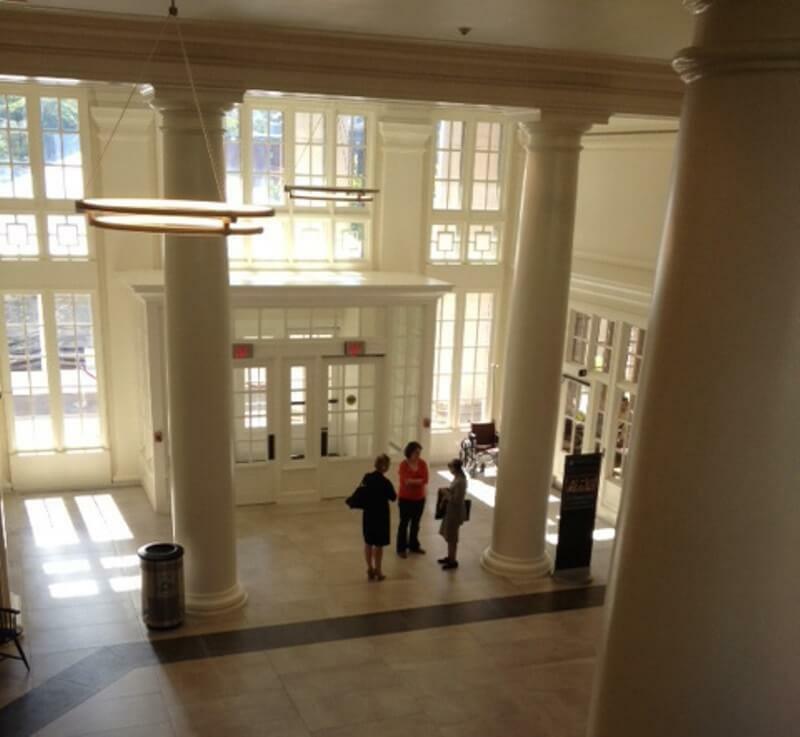 Greek Revival inspired, the red brick building’s main south-facing entry exhibits six monumental columns supporting a large triangular entablature with entry doors centered in the portico. Over time, the original entryway to Peter Bent Brigham Hospital was replaced with a revolving aluminum storefront, which deterred from and diminished the historic character of the south façade. Although a small component to the larger project, the scope of work for M&A was no doubt significant to restoring the historic integrity of the Peter Bent Brigham Hospital’s approach and entry façade. 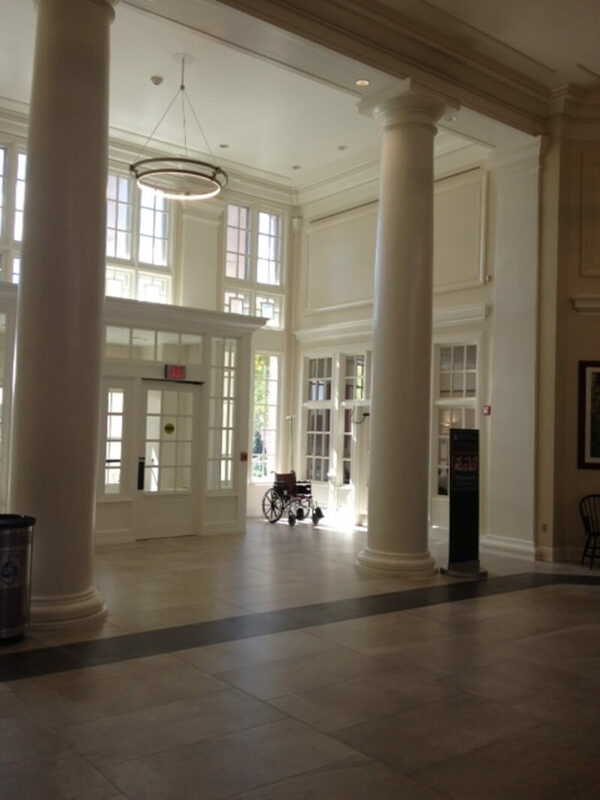 M&A partnered with Century Woodworking out of Pleasant Valley, CT, to fabricate an historically accurate reproduction of the 1913 grand entry to the hospital using the historic architectural blueprints as a guide. Profiles for the vestibule’s trim were taken from adjacent historic millwork at existing windows, tying the space together. Two new windows to match existing ones were made to flank the new vestibule, which was smaller in scale than the aluminum revolving storefront it replaced. In 2015, the Boston Preservation Alliance named the Brigham Patient Parking Garage/Stoneman Centennial Park, to which the rotunda renovations were closely tied, as a winner of one of its 2015 Preservation Achievement Awards. The newly restored grand entry overlooks calming green space, allowing one to be transported to an urban landscape similar to one that patients entering Peter Bent Brigham Hospital in 1913 likely witnessed.